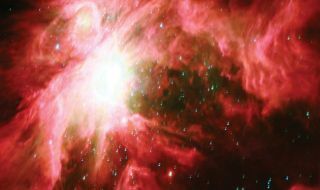 The Great Orion Nebula as seen by Microsoft's free online WorldWide Telescope. Exploring theuniverse can be as simple as turning on your home computer thanks to a newdigital archive filled with views from some of the world's best land- andspace-based telescopes. Microsoftofficially launched the free online WorldWide Telescope, which allows Internetdenizens to pan around and zoom through the night sky. "The WorldWideTelescope is a powerful tool for science and education that makes it possiblefor everyone to explore the universe," said Bill Gates, chairman ofMicrosoft. "Our hope is that it will inspire young people to exploreastronomy and science, and help researchers in their quest to better understandthe universe." Thatfreedom to explore the heavens comes courtesy of both software and Web 2.0services that take advantage of the Microsoft Visual Experience Engine. The WorldWideTelescope takes terabytes of the best images from professional telescopes and createshigh-resolution panoramas of celestial bodies that relate to their actualposition in the sky. Choosyusers can decide which telescope they want to peer through, including theHubble Space Telescope, the Chandra X-Ray Observatory Center, the Spitzer Space Telescope andothers. NASA continues to upgradeexisting space telescopes such as Hubble, and has plans for futuretelescopes that could go onthe moon. Adventuroustypes can also leap back and forth between past and future to see the changinglocations of the planets in the sky, or view the universe through differentwavelengths of the light spectrum to reveal strange mysteries such as a giant holein the universe. People can examineeverything from the solar system to beyond the Milky Way galaxy, or followguided tours headed by astronomers and educators at major universities andplanetariums, drawing praise from some professional astronomers for itseducational value and its usefulness in their own work. "Userscan see the X-ray view of the sky, zoom into bright radiation clouds, and thencross-fade into the visible light view and discover the cloud remnants of asupernova explosion from a thousand years ago," said Roy Gould, aresearcher at the Harvard-Smithsonian Center for Astrophysics. "I believe this new creation fromMicrosoft will have a profound impact on the way we view the universe." The WorldWideTelescope stands as "a beautiful platform for explaining and gettingpeople excited about astronomy, and I think the professional astronomers willcome to use it as well," said Roy Williams, senior scientist from theCalifornia Institute of Technology.